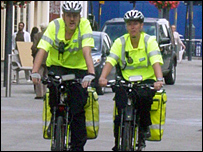 Bicycle ambulances have been introduced in Leeds city centre after a pilot project proved successful. Paramedics will use cycles carrying life-saving equipment to get to medical emergencies in the city. The Lifecycle - a cycling paramedic - will now be a permanent response on Yorkshire Ambulance Service's rotas. Members of a team of eight will work seven days a week. Their bikes carry defibrillators and other kits to give immediate assistance. The Lifecycle began two years ago as an experiment in York. It helped stand down 20% of ambulances, freeing them to attend other emergencies. Every member of the team attends an International Police Mountain Bike Association course on emergency services cycling.